Spoiler Alert: Hardened steel (AR500) is the safest. Check out the full thread over at INgunowners for lots of great pics and info. Bad URL, The “Check out the full thread over at INgunowners for lots of great pics and info.” has the URL as the title tag and the title as the URL. Oops, rookie mistake! Thanks for the heads up Mike. Interesting but pointless. I would have thought anyone who has shot at a target before could figure this out. Higher velocity bullets splatter more than low ones, softer steel reacts and pieces fall off. Having said that i do like the testing these guys do, they make sure to cover everything. Thanks for the pickup Mike. Just a side note– the test rig you pictured was actually one he tried initially but it didn’t work, so he moved to another setup. The overall point of the thread was to keep folks safe and let them know that shooting that scrap steel they found in the junkyard is a crap shoot with every round. 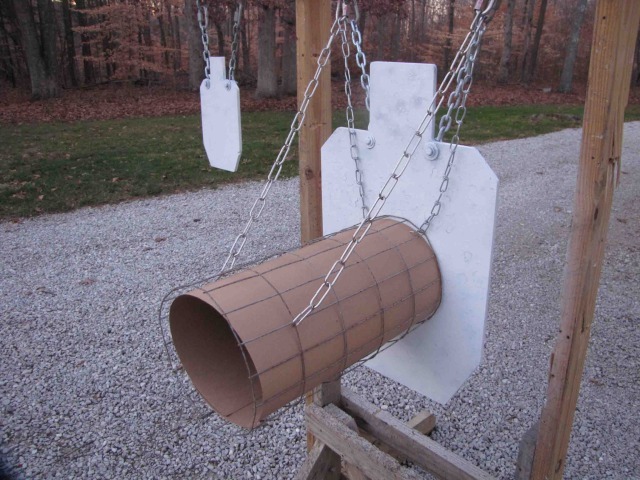 Decrease your risk by shooting steel designed to be used as targets (AR500). Again, we appreciate your help in spreading the knowledge. Knew a guy who went to a shoot where they had some steel that was cratered. He was standing near a shooter whose bullet hit a crater a piece of the bullet came back and hit his face had to get the piece removed for his sinus cavity. Shooting a match in a sand pit, in alabama,safe distance from the steel, cars parked 10-20 yards behind firing line, pond furhter back. As firing was going on you could hear pieces of lead hitting the water and find osme on your car. Had a chairity steel plate shoot, steel plates on 3/4 in plywood after the match the wood was about eaten thru and cars parked on the other side of a sand mound had lead fragments on them.